On the course, with its gently rolling hills, nature is the leading actor.The natural fairways of Golf Club I Girasoli, have infact been carried out respecting the nature and the local herbaceous cultivation.Having made this choice on 99% of the course no weed killers nor toxicant pollutive substances are being used. Only on the greens, but in very reduced quantities, essential products in order to keep them playable are used, these are chosen among a non harmful range, preferring anyhow to remove the weeds by hand. The result of this choice is a course similar to the scottish links, with a beautiful driving range where you can practice your game. 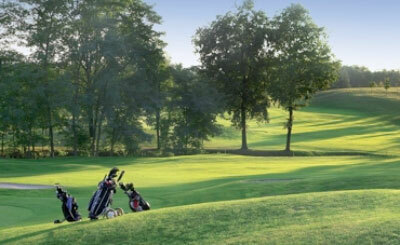 It's an 18 holes par 71, designed by the founders of the club, with a foreseen extension project. No stretch of the course is near any road and among the poplar groves and Arneis vineyards that skirt the holes, the only noise one can hear is the regular sounding of the bells from the nearby Casanova Abbey. Last but not least the championship golf course La Margherita, 18 challenging holes few meters away from our course, for a bigger choice of golf.